Click on the image above to visit Renaissance Magazine's website and subscribe! 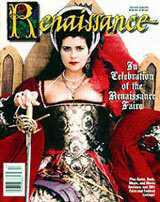 Renaissance Magazine is a print publication that features articles on history, castles, heraldry, culinary and herbal arts, and in-depth interviews with the movers and shakers of the re-enactment and faire communities. Regular columns review period books, movies, music, web sites, and games. Click on the image above to subscribe to the Renaissance Faires News e-newsletter, which can be delivered directly to your email address every month. Back issues are now available! A comprehensive, updated list of Renaissance festivals, Shakespeare festivals, and jousting tournaments, compiled by Renaissance Magazine. The list organizes the events by U.S. state and internationally (Australia, Canada, England, Denmark, Sweden), and also includes Shakespeare festivals in the U.S. and Canada. If you have news to share, email Jonathan Kantrowitz. If you are having any problems with this weblog, email Sarah Espano. Opening May 15 at The Cloisters, the exhibition Search for the Unicorn: An Exhibition in Honor of The Cloisters’ 75th Anniversary will include some 40 works of art in diverse media drawn from the collections of the Metropolitan Museum, other public institutions, and private collections. Among the Museum’s most treasured objects, the seven individual hangings collectively known as the Unicorn Tapestries are among the most beautiful and complex works of art surviving from the late Middle Ages. Woven in wool and silk, the tapestries depict vividly a hunt for the magical unicorn set against a verdant landscape. The exhibition will present the Unicorn Tapestries as the finest expression of a subject treated widely in both European art and science, from the Middle Ages through the Renaissance. Given by John D. Rockefeller Jr. in time for the opening of The Cloisters in 1938, the Unicorn Tapestries are its best-known masterpieces; yet, 75 years later, their history and meaning remain as elusive as the mythical beast itself. The tapestries have been seen both as complicated metaphors for Christ and as a celebration of matrimony. They are emblematic of medieval notions of the magic inherent in the natural world that endured through the Renaissance. The Morgan Library and Museum will lend its celebrated English Bestiary, a 12th-century manuscript that depicts the unicorn with its head in the lap of a maiden. A late 15th-century majolica dish made for the marriage of Matthias Corvinus (1440–1490), king of Hungary, and Beatrix of Aragon presents a similar image of the unicorn as a metaphor of love and marriage, with the couple’s entwined coats of arms reinforcing the idea of a happy alliance. A pair of unicorns draws a golden chariot representing Chastity on a Florentine desco da parto, a tray or salver painted in celebration of the birth of a child (North Carolina Museum of Art). In the Meshal ha-Kadmoni (Fable of the Ancients), unicorns and other animals are used to present moral lessons. The first printed and illustrated edition of this 13th-century Hebrew text, published in Brescia, Italy in 1491, is on loan from The Library of The Jewish Theological Seminary. The text of the nearly contemporary Peregrinatio in terram sanctam, an illustrated travel diary to the Holy Land that was printed in Germany in 1486 and is in the collection of the Metropolitan Museum, claims that its woodcut of a unicorn was drawn from life. Indeed, the unicorn was often associated with faraway lands. A page from a 14th-century copy of the Shahnama, a 10th-century text that recounts the legendary deeds of the Persian kings, features Iskandar (Alexander the Great) killing the monster of Habash (Ethiopia), an elegant one-horned beast, quite like a unicorn. A 16th-century engraving by Julius Goltzius after Maerten de Vos suggests that the unicorn’s natural habitat was the American continent! Where the creature resided might be debated, but unicorns were included—and depicted—in early encyclopedias of animals, like Konrad Gesner’s treatise, published in four volumes, 1551–58. (These works are also drawn from the Metropolitan Museum’s collection. )A large number of plants that appear in the Unicorn Tapestries are recognizable species, many of which are cultivated in the gardens at The Cloisters. rocket piano on Approximately 6,000 people from around the United States and overseas came to Canyon Moon Ranch last week for "Estrella War XXV…"
http://www.yourshortlink.net on Approximately 6,000 people from around the United States and overseas came to Canyon Moon Ranch last week for "Estrella War XXV…"